Having collected over 2.8 million member surveys in the past 8 years for nearly 100 credit unions, we have gained some insights about loyalty score movement and the things that can influence it. Our credit union participants utilize a consistent Net Promoter Score® methodology, which allows us to publish a quarterly benchmark for the industry. While the information we are sharing can be used as a guidepost, it is important to note that your credit union’s scores may not be directly comparable because of questionnaire or collection methodology differences. Over the past 8 years, the overall average change in Net Promoter Score has been +1.3 points. When considering credit unions that improved their score, the average change has been +5 points. A realistic goal for your credit union’s program depends on a number of factors, however, including the level of your current score. In terms of estimating score movement for 2017, it is important to note that higher scoring organizations tend to move the score more slowly and may have to work diligently just to keep their scores at lofty levels. Lower scoring organizations tend to move the score more rapidly. This is due to the way NPS is calculated. 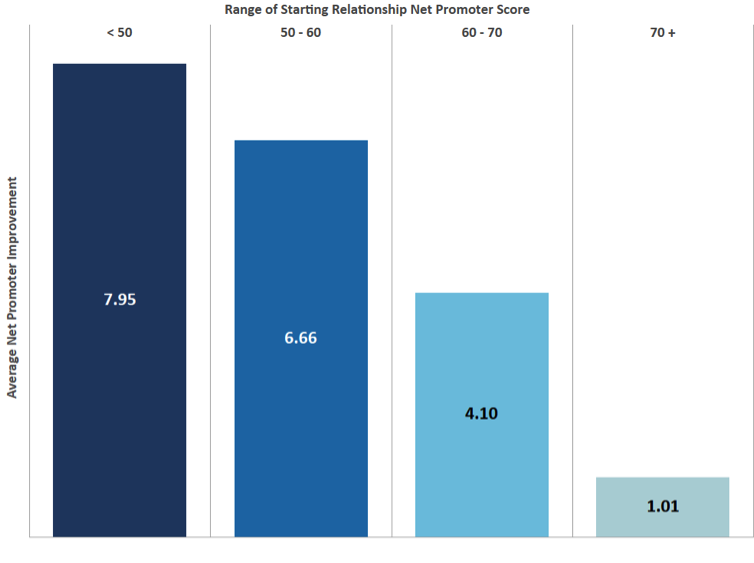 Lower scoring organizations generally have a larger percentage of Detractors, which when converted to Promoters, has a doubling effect on the NPS (e.g., converting 5% Detractors to Promoters, yields a 10 point increase to NPS). Higher scoring organizations tend to have a lower percentage of Detractors, therefore not as much opportunity for Promoter conversion. The chart below illustrates the decreasing improvements that are seen when the NPS or loyalty score increases. As you set your 2017 targets, keep in mind that even the best performing credit unions have also seen score decreases. We recommend that you be realistic about loyalty/service measurement goal setting when large changes are on the horizon. You may want to consider setting a goal which keeps your score level or even factor in a temporary decrease at those times. In the chart below, the green line demonstrates the dramatic impact that a merger can have on an organization’s NPS and the gradual “rebound” period that follows. The other organizations show more moderate dips and faster rebounds. Download your complimentary copy of the new guide today! Learn more about setting realistic goals for your credit union’s loyalty score by downloading your complimentary copy of our new guide for 2017. You can also learn more about Member Loyalty Group’s Member Experience programs by contacting us at [email protected]. Net Promoter, Net Promoter Score, and NPS are trademarks of Satmetrix Systems, Inc., Bain & Company, Inc., and Fred Reichheld. Copyright © 2016 by Member Loyalty Group. This blog originally appeared on cuinsight.com.